• Was a myocardial infarction ruled out? • Has the possibility of a pulmonary embolus been considered? • Are the symptoms suggestive of an aortic dissection? head: He worries about a pulmonary embolism, which is the most serious cause of unexplained dyspnea. He wants a venogram or a Doppler ultrasound of the lower extremities and a ventilation/perfusion scan, possibly a pulmonary angiography after that—and he wants Giufeng and Ajay to organize all of it. Giufeng gives him her best irritated look and suggests bringing Mrs. Candi to the CT scanner at once to answer all questions with just one examination—a "one-stop-shop" procedure. That one examination would suffice to cover the whole differential, she declares. Ajay is really impressed and Reginald complies after just a little resistance. Pulmonary embolism: Pulmonary embolism is a frequent disease and also frequently overlooked—in excess of 50%; the CXR tends to be normal. f Most pulmonary embolisms are not diagnosed because i the entity is not considered at all. Fig. 6.51 Observe the CXR of Mrs. Candi. Do you agree with Giufeng and Ajay? CT (Fig. 6.53a). The ventilation-perfusion scan shows a discrepancy between intact ventilation and missing perfusion to the affected segment of lung, also called "mismatch" (Fig. 6.54a). f A comprehensive CT protocol for pulmonary embolism ¿ nowadays encompasses a CT angiography of the pulmonary arteries (Fig. 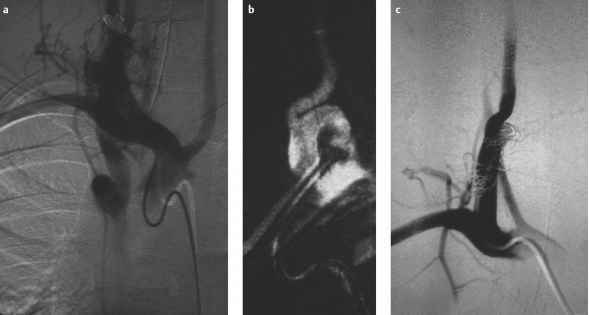 6.53b) and a CT venography (performed immediately afterwards and without the need for additional contrast medium administration) starting at the level of the knee joint and proceeding to the confluence of the common iliac veins at the bottom of the vena cava (Fig. 6.53c). Above that level, thrombosis is very rare. Patients with venous thrombosis below knee level do not require treatment with anticoagulation, therefore detection would not alter management significantly. Aortic dissection: An aortic dissection starts with an inti-mal tear, frequently in the ascending aorta just above the valvular level, through which blood enters the aortic wall and separates the aortic wall layers. Aortic dissection occurs frequently in patients with arterial hypertension and those with Marfan syndrome. Excruciating pain and dyspnea occur as often as in pulmonary embolism. If the dissection blocks the origin of a coronary artery, myocardial infarction may ensue. 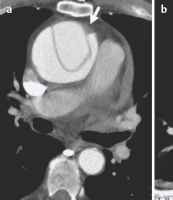 CT angiography of the pulmonary vessels also depicts the aorta in a contrast medium phase that will also demonstrate aortic dissection. 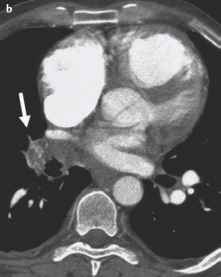 In order to exclude both entities in one scan session on a fast multidetector-row CT scanner, the scan delay after beginning of the contrast injection in the CT scanner may need to be increased compared to the exclusion of pulmonary embolus alone, or you need to scan twice in rapid succession in order to ensure that there is sufficient contrast in the aorta. It is very important to determine the involvement of the ascending aorta in aortic dissection (type A), because of the risk of myocardial infarction (Fig. 6.55a, b). A type A dissection thus requires immediate surgery. Fortunately, the cervical vessels exiting the arch often prevent the retrograde extension of dissections originating in the descending aortic arch into the ascending aorta (type B, Fig. 6.55c). Type B dissection is less dangerous and is most often managed conservatively unless relevant organ arteries are occluded. If this happens, the vascular surgeon or the interventional radiologist swings into action: The occluding dissection membrane is perforated with a special technique and/or a stent is applied to restore perfusion (Fig. 6.56). Fig. 6.52 Note the typical basilar platelike atelectasis that is seen in patients with pulmonary embolism but is certainly also a frequent finding in all patients unable to take a deep breath in (for example, after abdominal surgery). 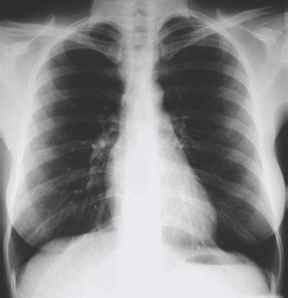 The most common finding in patients with pulmonary embolism is a normal CXR. Fig. 6.53 a The opacity in the lower lobe shows the typical triangular shape of a vascular territory. This is a classic pulmonary infarction due to pulmonary embolism (left). The reduced perfusion of the right lung is also suggested by the loss of vascular markings (right). 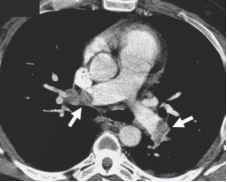 b The fresh embolic material is appreciated in both pulmonary arteries as central filling defects in the vessel and outlined by the administered intravenous contrast (arrows). 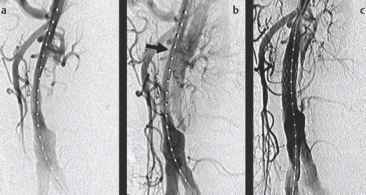 An older embolus tends to cling to the vascular wall molded along its circumference. c CT venography shows the presumptive cause of the embolism—a thrombus in the left femoral vein (left) that extends up into the inferior vena cava (right). Only the more expensive and cumbersome MR venography rivals the reliability of CT for thrombus detection. in the diagnosis of pulmonary embolism is decreasing continuously. As opposed to CT, the sensitivity of scintigraphy is also hampered by any coexisting pulmonary parenchymal abnormalities such as pneumonia or atelectasis, which are common findings in many patients at increased risk for pulmonary embolus. Fr obstructed, however. In this patient the outflow of the coronary arteries is still detectable (arrow), but an immediate surgical intervention was necessary. By the way, the aortic dissection is also visible—as in a—in the descending aorta. 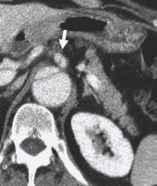 c Lastly, the dissection may also extend into larger branch vessels, such as the superior mesenteric artery (arrow). Fig. 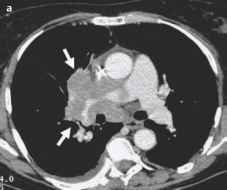 6.57 a This patient also reached the emergency room with the preliminary diagnosis of pulmonary embolism. The documented tumor masses around the right main bronchus proved to be non-Hodgkin lymphoma. 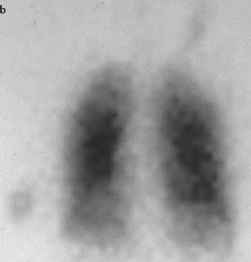 b It could, of course, also have been an extensive bronchial carcinoma (arrow) such as in this patient. Pneumonia: Pneumonia can demonstrate similar symptoms and may be all but invisible on plain CXRs—for example, if it is located in the dense retrocardiac area or if the patient is grossly overweight and difficult to image (see Fig. 6.11a). Again, CT will also diagnose this entity without problems. Mediastinal/pulmonary tumor: A mediastinal or pulmonary tumor may also cause clinical symptoms that resemble pulmonary embolism (Fig. 6.57). (arrow) with a balloon, the renal arteries are reperfused. c Because the patient remained symptomatic, the dissection membrane was reapproximated to the vessel wall by deploying a stent (a small expandable wire-mesh tube) distal to the fenestration. This procedure finally provided symptomatic relief. • Diagnosis: Giufeng has persuaded Doc Reginald. The immediate CT examination reveals the true problem in this case (Fig. 6.58). A type A aortic dissection is present that needs surgical attention "stante pede" (that is: while standing on this foot, immediately, on the double). Reginald is relieved to have the diagnosis and contacts the thoracic surgeon on call. The senior medical consultant, who has also been alerted, inquires who this bright young lady in the chest imaging unit might be. Fig. 6.58a A dissection membrane is well appreciated in the ascending as well as the descending aorta. The coronary arteries are in acute jeopardy. b In the abdomen, another problems becomes evident: The left kidney is no longer perfused.